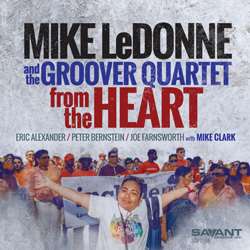 For three decades Mike LeDonne has been an exceptional avatar of the Hammond B3 organ. Forged by his impressive jazz apprenticeship, with the likes of Milt Jackson, George Coleman and Benny Golson, LeDonne comes from a long and distinguished line of masters of that instrument. And for eighteen years, he's lead the Groover Quartet his formidable foursome consisting of tenor saxophonist Eric Alexander, guitarist Peter Bernstein and drummer Joe Farnsworth. Joining the quartet is the great drummer Mike Clark. After collaborations with Herbie Hancock, Christian McBride, Nicholas Payton and others, Clark has influenced a generation of percussionists and brings his own unmistakable style to two tracks on the CD.